If I don't like the color of my teeth, how can I tell if whitening would be a good option for me? The first step in deciding whether or not to whiten teeth should always be a proper dental examination — with x-ray pictures — to determine the cause of the tooth discoloration. This is the best context in which to explore whitening options, with the person who is in the best position to advise you: your dentist. The optimal, most natural-looking tooth shade is always the one that creates a match between the whiteness of the teeth and the whites of a person's eyes. Is there any reason why I shouldn't try whitening my teeth? The pre-bleaching exam may reveal a need for a particular treatment, before or even instead of bleaching. For example, there are several causes for discoloration — abscessed teeth, decay, and root canal problems, to name a few — for which bleaching will mask but not resolve the problem. There are also some aesthetic considerations, such as how much of your teeth and gums show when you smile. Typically, short teeth and a gummy smile do not look better with bleaching because whiter teeth will accentuate the gummy smile. Also, exposed tooth roots don't bleach, so if you have root exposure, your results won't be ideal. In either of these cases, you may want to consider other cosmetic options. In-office whitening procedures begin by protecting your lips, gums and mouth, leaving only your teeth exposed for the application of the whitening gel. A large body of research on bleaching has determined that low concentrations of peroxide, from a reputable source, are safe if used as directed, after a proper dental examination. However, tooth sensitivity is a common side effect of bleaching. Solutions that are more acidic can etch the enamel from the teeth, especially if used for long periods of time, so are to be avoided. The most common and thoroughly researched bleaching substances are 10% carbamide peroxide (used at home in mouthtrays) and 35% hydrogen peroxide (used in a dentist's office). Carbamide peroxide is actually hydrogen peroxide plus urea. Carbamide peroxide products remain active longer — for up to 10 hours and lessen acidity to a level where the enamel is not affected and the person cannot get tooth decay. Hydrogen peroxide may come in stronger concentrations, but only stays active for up to an hour and is more acidic, so should not remain on the teeth for extensive lengths of time. There are carbamide peroxide materials for both at home and in the office treatment, as well as hydrogen peroxide materials for in the office and at home treatment. The concentrations vary, and determine the treatment time and technique. Also, if a high concentration of material is being used, your dentist must take steps to protect your gums from coming into contact with it. Since peroxide even at a low concentration can burn inflamed gum tissue, your gums need to be healthy prior to bleaching. Waiting two weeks after having the teeth cleaned is advisable, as well as using a soft toothbrush with the appropriate brushing (not scrubbing!) technique. Teeth yellow with age; a variety of foods and beverages can also cause darkening and discoloration. 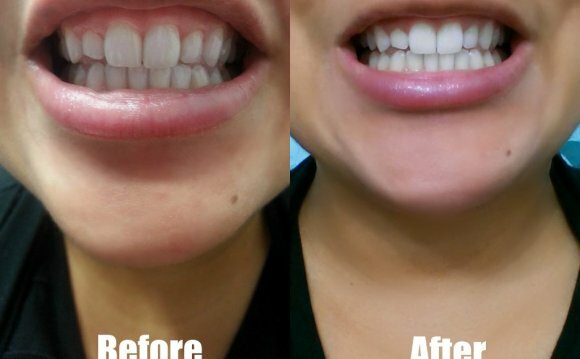 A smile can be returned to brilliance with today's teeth whitening products. If my teeth do become sensitive during the whitening process, is there anything I can do about it? First of all, if you already know you have sensitive teeth, there are precautions you can take before beginning the bleaching process. Brushing with a desensitizing toothpaste containing potassium nitrate for two weeks prior to bleaching can reduce sensitivity. Using potassium nitrate during the bleaching process (in the bleaching tray) can also help, as can reducing the frequency of bleach application, the duration of treatment, and taking breaks from the continuous application of the bleach.